Home » » DVD Review: Emergency season three. 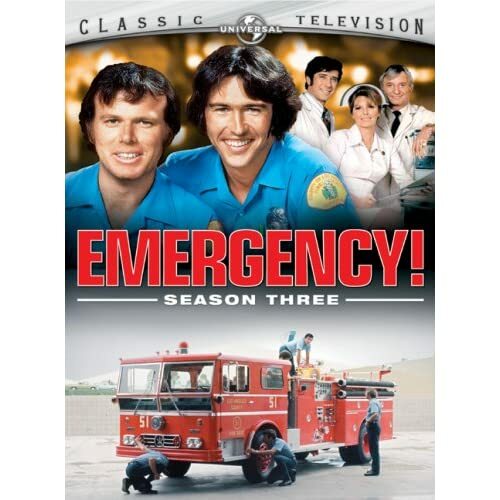 DVD Review: Emergency season three. Before we get to the review, I would like to take a minute to welcome Miz Naomi to the Crimespree home. If you can make it through the 1970s melodrama and the quasi-Dragnet speechifying of the first two seasons, you’ll find that, in the third season, this series finally comes into its own. The scripts are better paced, providing a better balance of talk and action, and the actors are more comfortable in their roles. One of the keys to the success of the show is the chemistry between the two main characters. Johnny Gage and Roy DeSoto are partners in the Los Angeles Fire Department’s fledgling paramedic program. Roy (Kevin Tighe), is the quiet, grounded one; married with kids. Johnny (Randolph Mantooth) is, of course, the complete opposite: single, impulsive, given to flights of cockeyed reasoning. There is some fine acting here. Tighe plays the more reserved DeSoto as alternately amused and exasperated with his partner. Mantooth plays Johnny with puppy-dog charm. Not that I subscribed to Tiger Beat, you understand. I just saw it on the news stand when I was picking up my copy of The Smithsonian.